Are Sports Drinks a Smart Choice for Young Athletes? By Natalie Digate Muth, M.D., M.P.H., R.D. Driven to excel, many youth athletes push through sports practices and games to the point of exhaustion. While this physical exertion can benefit cardiovascular fitness, a developing competitive spirit and a child’s enjoyment of the game, without appropriate attention to hydration, youth athletes can suffer serious consequences, especially when exercising in the heat. Coaches, athletic trainers, pediatricians, parents and even youth athletes know that kids need to push fluids during physical activity. Most textbooks describe how kids are more vulnerable than adults when it comes to regulating body temperature and staying ahead of thirst. So kids drink up—frequently reaching for sports drinks, energy drinks and other flavored beverages rather than water. In one study, more than 50 percent of adolescents used sports drinks and 42 percent had used sports drinks in the two weeks preceding the survey (O’Dea, 2003). While in some cases sports drinks (but not energy drinks) may provide benefits to youth athletes, in other cases the reliance on sweetened beverages does little more than negate the health benefits of exercise and contribute to the worldwide problem of childhood obesity. 1. Contrary to previous thinking, kids do not have a less-effective ability to regulate body temperature and tolerate high levels of physical exertion when exercising in the heat compared to their adult counterparts as long as they maintain appropriate hydration. This conclusion is a major departure from the previous caution that kids innately have a poor ability to regulate body temperature. 2. Most kids can safely participate in outdoor sports and other physically challenging endeavors in a variety of climates, including warm to hot conditions. However, in addition to ensuring adequate hydration, coaches, parents and other supervising adults need to ensure the children are allowed sufficient recovery between workouts, same-day training sessions or rounds of sports competition; that they wear appropriate clothing, uniforms and protective equipment (when necessary) so as to not retain excessive heat; and that the adults key in to the child’s fitness level and gradually (rather than abruptly) increase exercise exertion. 3. Proper hydration is essential for optimal health and athletic performance. In the vast majority of cases, plain water should be the primary source of hydration for children and adolescents. Thirst is generally a good guide in determining intake. A more precise method of monitoring hydration status is to weigh the child both before and after exercise. The goal is to avoid weight loss following a single bout of activity. 4. Sports drinks—beverages containing carbohydrates, protein, or electrolytes—play a role in ensuring appropriate hydration and nutrition for optimal performance in combination with water during intense and prolonged exercise lasting more than one hour. 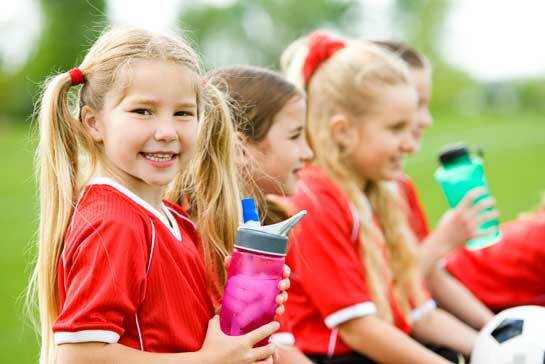 However, routine consumption of sports drinks for the average child engaged in routine physical activity, or in place of water in the lunchroom or at home, can lead to excessive caloric intake and increased risk of overweight and dental problems. This has become an especially widespread problem as sports drinks have replaced soda in school vending machines and cafeterias. 5. Energy drinks—beverages containing caffeine in addition to carbohydrate—should be avoided. While caffeine may provide performance benefits for adults, its effects have not been well studied in children. Furthermore, it is difficult to know the true caffeine content for many drinks. Some may contain as much as 500 mg, which is equivalent to about 14 cans of soda. A lethal dose of caffeine is somewhere around 100 to 200 mg per pound of body weight (therefore, the impact of caffeine is most significant for younger and lighter kids), but caffeine toxicity can occur at much smaller doses. Overall, parents, coaches and schools should not offer or allow children to drink energy drinks. Energy drinks pose potential health risks primarily because of their stimulant (caffeine) content and are never safe for children. Large Gatorade coolers and various other sports drinks have become hallmarks at youth sporting events and in many places have displaced water as the go-to drink. While sports drinks may be necessary for certain athletes performing high-intensity and prolonged exercise, water remains the ideal beverage to optimize hydration, control body temperature in challenging climates, and set the stage for a successful physical pursuit for active youth. Bergeron, M.F., Rice, S.G. and Devore, C.D (2011). Policy statement—climatic heat stress and exercising children and adolescents. Pediatrics, 128, e741–e747. Committee on Nutrition and the Council on Sports Medicine and Fitness (2011). Clinical report—sports drinks and energy drinks for children and adolescents: Are they appropriate? Pediatrics, 127, 1182–1189. O’Dea, J.A. (2003). Consumption of nutritional supplements among adolescents: Usage and perceived benefits. Health Education Research, 18, 1, 98–107. Core training is a now-common term that is frequently misused. To determine what it really means for trainers, how to use it most effectively in training your clients, and to gain a solid understanding of the movement patterns, read our FitNovatives™ Expert Blog Post from ACE’s own Pete McCall. With the start of 2012 and the New Year’s resolution crowd eager to jump onto the fitness bandwagon, personal trainers are in high demand. With a small window to maximize these opportunities, trainers everywhere will be looking to beef up their client roster in the coming weeks. Keeping clients engaged, motivated and coming back for more takes creativity, skills and forward thinking on the part of trainers. Exercise is physical stress applied to the human body. Learning what roles hormones and chemicals play to create different physiological responses is critical to exercise design and to achieving favorable responses for your clients. Do you know which hormones are responsible for muscle growth vs. breaking down muscle tissue? Are you proficient in designing safe and effective exercise programs that maximize muscle growth and fat utilization based on hormonal response to training stimuli?